The amount of people who listen to commercial radio stations over community stations is certainly much higher. Given their bigger budgets and market saturation it’s no wonder. 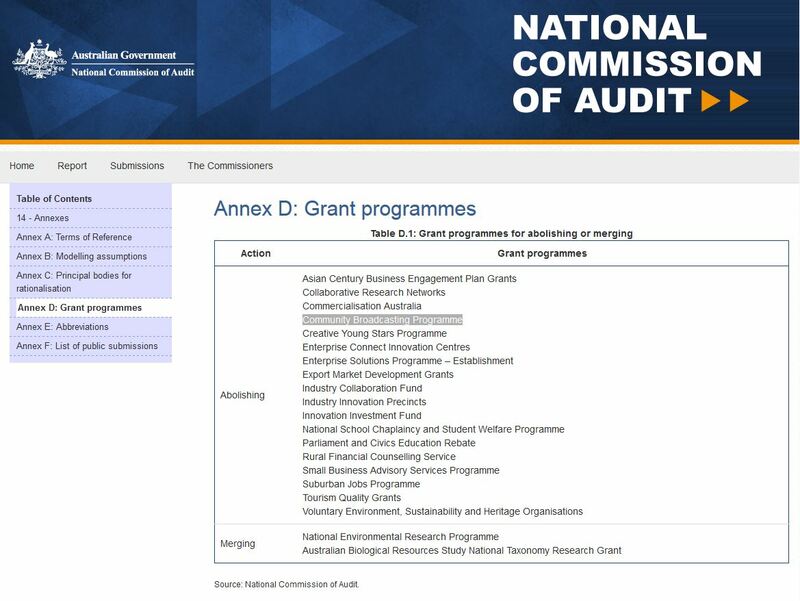 Recent developments may see your local community radio station about to see that gap in funding grow even wider if the Commission of Audit gets is way. It’s recommendation is that community stations are kept out of the upcoming federal budget. A recommendation that’s not sitting too well with station managers of more than 380 local community radio stations around the country. About 380 community broadcasters operate in Australia, many of them fulfilling niche audiences such as ethnic language radio, radio for the print handicapped and blind, indigenous radio and small country stations. Stations are mostly run by volunteers and operate with $17 million in federal funds and through sponsorship and audience pledges. To most people though it’s not a big deal. As long as they have their top 40 hits and mindless comedic duos to listen to as they sit in traffic during their daily commute they’re contempt to let community radio suffer a slow death. Community radio relies mostly on the public for donations to keep their volunteer operations going. Unlike the big commercial stations who are funded by the countless advertisers paying big bucks to force their ads onto you. I recently spoke to a colleague of mine, Mick Raven from Conspiracyoz.com who is also a program committee member and hosts his own show (The Raven Report) on Sydney’s Radio Northern Beaches, a community station near Manly. “If the federal government gets their way, which looks to be the case, and community radio funding is abolished then it will be a major set back for those of us in the alternative news media who are trying to cut through the matrix and offer Australians a way out their regular programming. And by programming I mean brainwashing”, said Mr Raven. There aren’t many radio stations out there willing to broadcast an alternative view on world and local news. With this new decision to abolish funding for community broadcasting it looks like the alternative media has an even bigger battle on their hands. The Commission of Audit reports are available to read here. However, you can see a screenshot below direct from the government website showing you just what’s on the chopping board. Highlighted: Community Broadcasting Programme. Straight from the horses mouth. Among other programmes, Community Broadcasting will now have zero government funding.